In small space living, it is essential for areas to be multi-functional. In this design, the bathroom dissapears into a sleek walk-through entry when the door alongside the right-hand wall is "closed". When "open", the area is closed off to the rest of the living area and becomes an open layout bathroom. For additional functionality, the hammock chair rests on a track and can be moved from the office area to the living area to provide additional seating for guests. The custom built-in sofa can be pulled out into a full size bed in one motion. 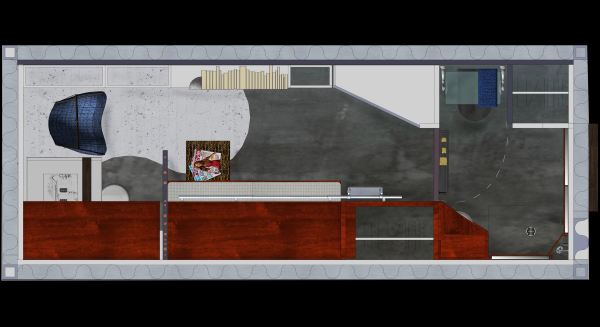 Warm hues, and layered textures are used to counteract the industrial feeling of the raw materials in the shipping container. Perspective view. 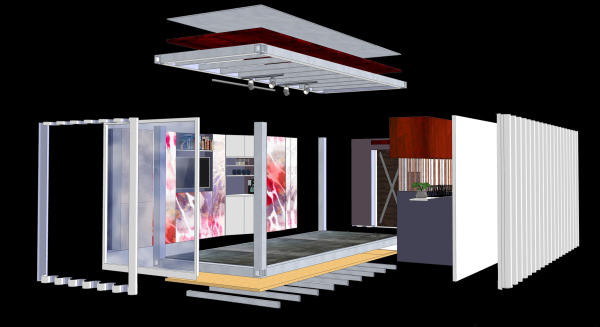 A thorough programme is used to identify all of the necessary elements that are required of this small space. Each item is listed and adjacency requirements are indexed before the design process begins. Here we see how everything fits together. Exploded Oblique. An elevation of the west wall, which houses ample storage covered by a lacquered veneer. 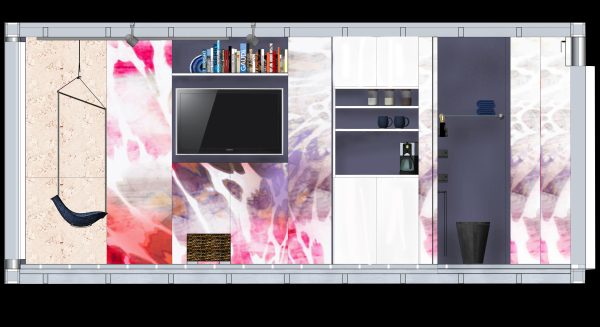 When storage units are closed, the wall is enveloped by a seamless piece of art which can be customized per individual client personality. 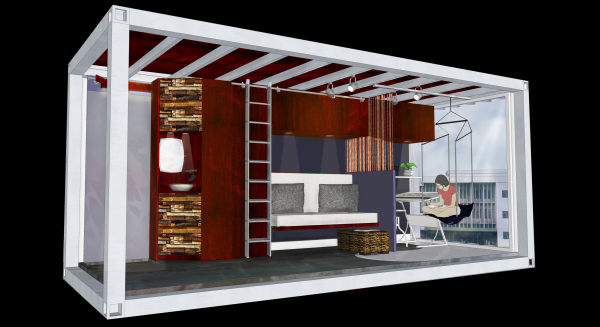 In the floor plan, one can see how modular design utilizes multi-functional areas to optimize the small space.